Successfully Added Lenovo Xiaoxin Tablet PC - Android 7.1, Octa Core Snapdragon CPU, 4GB RAM, 8 Inch 1920 x 1200 Display, 4850mAh Battery to your Shopping Cart. 8 Inch IPS screen with 1920 x 1200 resolutions makes for stunning viewing. The Lenovo Xiaoxin TB 8804F is one of the best mid-range tablets around. It has an Octa-Core Snapdragon 625 processor and 4GB of RAM. This runs in conjunction with the Adreno 560 GPU so it is well equipped for gaming. There is 64GB of internal storage and the micro SD slot offers the ability to expand this with a further 128GB. The metallic uni-body design is simple yet elegant and with a slim profile it has the quality and finish you'd expect from a big name such as Lenovo. Thanks to the twin speaker outputs you get an awesome audio quality that further boosts is gaming and movie watching credentials. Another surprise is the camera quality. With an 8MP rear camera and front 5MP shooter, these are fairly impressive for a tablet PC and good for snapping off photos or video calls. With an 8 inch IPS screen that adopts a 16:9 aspect ratio and has a 1920 x 1200 resolution. Thanks to the IPS quality you get quality viewing even at wide angles. The richness of colors, high contrast and brightness are sensational. Running on Android 7.1 you will have access to all the best apps and games. 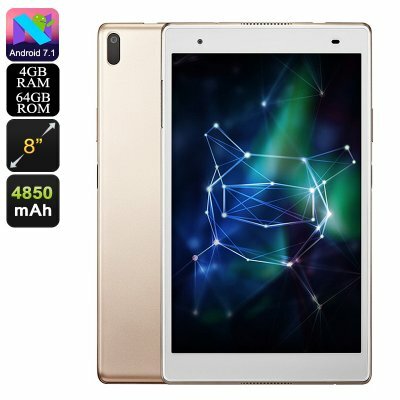 This tablet has a 4850mAh battery that will bring hours of entertainment from every charge. The Lenovo Xiaoxin TB - 8804F tablet PC comes with 12 months warranty, brought to you by the leader in electronic devices as well as wholesale Android tablets.